I was honored to be chosen to attend the 17th Biennial CLUW Convention in Reno, Nevada as both a delegate and a member of the CLUW Resolutions Committee. I flew to Reno on Monday, November 11. Tuesday, November 12, at 9 a.m., the Resolutions Committee met to take a final look at the Resolutions chosen for Convention approval and whether or not the Resolution Committee supported the Resolution. We also discussed what order the Resolutions would be presented to the CLUW delegates during the conference. We worked straight through successfully completing support of all the Resolutions with the exception of Resolution 1, the Four Year Plan, which we decided would be best tabled for the delegates to decide. On Wednesday, November 13, I attended three of the 32 Conference workshops. First, “Be a Bully Buster” which addressed workplace bullying presented by KC Wagner, Director or Workplace Issues, School of Industrial and Labor Relations at Cornell University. The workshop explored the different kinds of bullying that might take place in the workplace and different scenarios of how the victim can deal with the perpetrator in an effective manner. Second, “The Union’s Role in Addressing Domestic Violence, Sexual Assault and Stalking”, also presented by KC Wagner and joined by Maya Raghu, Senior Attorney at Futures Without Violence. This class went over the different kinds of domestic violence encountered and how to deal with it in the workplace situation; the examples they used dealt primarily with spousal abuse where the couples both worked at the same plant. But, it must be realized that even if the violence is only happening at home, it will influence the workplace environment. Third, I attended “Women of All Ages’ Concerns about Retirement” presented by Debra Berko, Secretary-Treasurer, Southern Nevada Central Labor Council, AFL-CIO. She didn’t have any handouts, but did go over a few resources for accessing information regarding retirement. Wednesday evening I attended the First Time Participants Orientation which was an enlightening meeting and included over 100 of the new delegates. They discussed what would happen during the convention and also went over the rules set forth by the Rules Committee for maintaining an orderly convention. The CLUW Convention follows Robert’s Rules of Order. At that time all the CLUW Officers were introduced, as well as the Sergeants-at-Arms. The Convention open plenary began at 8:30 a.m. on Thursday, November 14 and included almost 500 delegates, observers and officers. We assembled in the Grand Ballroom and many of the Local Unions walked in with their banners. Our banner had not arrived yet, so we weren’t able to rally in with the other Locals. I was disappointed about that, but it was enjoyable seeing the strong Union pride as the delegates marched in together as their Unions were announced. The Convention was occupied with the business of reports, awards and presentations. There were also many wonderful speakers. Dina Yarmus of the Philadelphia Chapter Young Women’s Committee spoke and ran a video regarding the continuing struggles of women in the workplace. We also had a video message from Richard Trumka, President of AFL-CIO. Laura Reyes, Secretary Treasurer of AFSCME, spoke to the convention about the challenges she faced raising a handicapped son and still succeeding as the second highest officer of AFSCME. And, Carmen Berkley, Director of AFL-CIO Department of Civil, Human and Women’s Rights conducted a panel concerning CLUW Activists along with Dina Yarmus, and Donchele Soper, member of IBEW and Central California CLUW. The CLUW Strategic Plan Subcommittee presented the 2013 Four Year Plan, which was Resolution Number One presented by the Resolution Committee. There were some questions, comments and objections from the floor. It was decided that the plan would best to be sent back to the Committee and re-evaluated before passing and implementation. This Convention was important because it marked the four-year election process of the CLUW National Officers Council. There were nominations, nomination speeches, and nomination acceptance speeches, as well as caucuses and campaigning. During the USW Caucus I was honored to be nominated as a Delegate to the NEB. 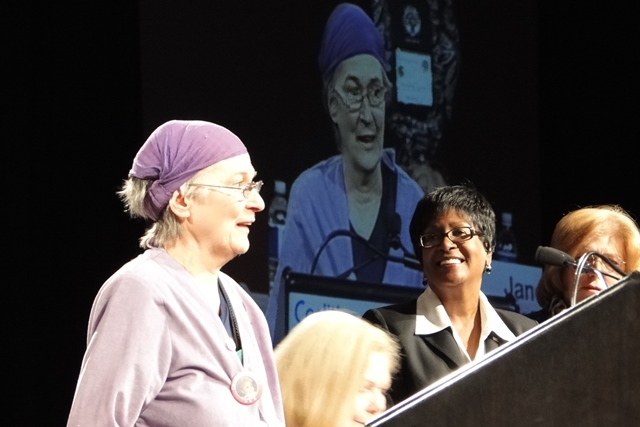 The delegates voted in a new president, Connie Leak of the UAW took the place of Karen See of the APWU. All other officers were re-elected, as well as four new National Vice Presidents: Carla Insinga of AFSCME; Jane Blume of UAW; LaTonya Crisp-Sauray of TWU; and Robyn Sherles of SEIU. As part of the convention, all the members of the Resolution Committee were required to be on the convention floor during the proceedings of the meeting. We were called to the stage a few times to read the resolutions out loud and have the body of the convention vote on the resolves. There was discussion and comments on every Resolution brought before the body. It was enlightening to see how passionate some people were on the issues. Friday night was the auction fundraiser. There were three: a silent auction, live auction and a tea cup auction. The bidding over a cloak during the life auction got a little wild, but it was all in fun, and being that it was for a good cause, the extra funds were a good thing. The person who ended up winning wasn’t sure what she bought, but she knew she wanted it! Saturday night was the Gala and there were food stations around the ballroom, including taco stations, prime rib and ham stations, and a dessert station. It was interesting to see people dressed in their best attire, and also people still in jeans. I made my rounds to say good-bye to new friends and went to pack so I could be up at 3 a.m. to catch my flight east. I was fortunate to meet a remarkable woman named Beatrice Lumpkin. She’s a 95-year-old activist who has worked continually to advance the rights of workers and establishing unions in the workplace, and she also participated in the formation of CLUW. She travels around the U.S. and speaks about her experiences in her book “Joy in the Struggle: My Life and Love”. We have been e-mailing back and forth and she’s still a busy Activist having recently participated in a Black Friday protest at a Wal-Mart in Chicago. My CLUW Convention experience was wonderful. I met many great people and felt the convention was a huge success. The feeling of camaraderie and solidarity was enough to build anyone up. I was very fortunate to have this opportunity.